Landscape is a transversal concept linking people, places and moments. It is natural and cultural, it is individual and social, it changes over time and is subject to change. It represents man's cumulative work, and of surplus capital. It is a source of wealth and is therefore subject to speculation. The natural landscape is socialised, the social landscape is mediated and industrial landscape is delocalised. This exhibition reaffirms us. Artists did not invent the landscape, but they are agents which contribute to their intervention, reproduction, understanding and interpretation. Although the depicted landscape is the result of extremely subjective delirium, it always will be a production that refers to a historical moment, in a social conjunction and cultural construct. What the artist invents is the need for a spectator of landscape, but the spectator is an emancipated subject who can reinterpret, rethink and take control of the suggested landscape once more. The artist's gaze does not have to coincide with the spectator's. Without landscape is not a rejection of the landscape, it is a claim that every landscape is the result of human action, that it is part of a process, and that every process involves some kind of disappearance, the landscape resulting from which is a new redefined space. Arturo / Fito Rodriguez Bornaetxea presented a work created from images of groups of people at meetings, on demonstrations, at assemblies, previously published in the media, and on which he hides the text on banners and posters, eliminating all kinds of traces which could identify or reference the event. The collage of images lacking identification causes standardisation. 'Concealment is a system of visual acuity, an incentive to criticise the gaze itself. We are facing process of organised prejudice evacuation, and of visual tools for media hygiene and disinfection. Mawatres, Juan Pablo Orduñez presented a paper on San Romà de Sau, a landscape which was taken over in order to generate a new production space. Now it is a swamp which, depending on water levels, causes the appearance and disappearance of whatever trace of inhabited memory. The landscape is not simply "mapped" another time, but redefines its own limits, questions pre-established visions and, above all, involves new agents-. It is said that a vocation is composed of two stages: vision and mission (visio and misio) (Gomá Lanzón, 2014). It is said that ordinary mortals' view of the world is fragmentary, chaotic, and that the mass cannot put it all together. A fragmented reading of certain parts, leads us to believe that we can read the whole, which ends up as a mirage, just like the belief that zapping from channel to channel is the same as watching all the programmes, or that surfing the internet, letting our curiosity take us to a website or a video, is the same as dominating the virtual universe. It is also said that there are some lucky people who have a complete view of the map, because with their imagination, they can fill in the voids which others cannot see. They have the clairvoyant ability to see fragments of the whole (vision), which leads them to create objects (works of art), "without utilitarian function" and make them available to themselves and to others (misio) . For this reason it is said that art is a vocation. Visionary artists, through artistic practice, help to complete the general vision of the map, and make our passage through life more bearable and more pleasant. So many things are said ... In the political, sociological landscape, even in the physical landscape surrounding us, there are many living visionaries, leading figures of neo-capitalism, who, contrary to what might seem, do not belong to the realm of art. Maybe that is why they entertain the fantasy belief in viewing the entire map, a map in which their interests, to monopolise the common wealth through the exploitation of common resources, become law. Overuse leads to exhaustion and to waking up from the dream, the vision of the map vanishes leaving us without a landscape. Only the fixed pieces which support power cliques are maintained, while the mass falls into an undignified, precarious existence. Meanwhile Mao Zedong's quote cited by Žižek, "Everything under heaven is in total chaos, the situation is excellent", makes unexpected sense. Where are the artists when nobody needs them? In spite of the evidence, vision remains dogmatised, and some believe in the misio of continuing to produce objects without useful function out of a conviction that support must be given to vocational emotions. These believers are, as Valcárcel Medina said, where others are not. They live within a landscape located in the now ancient modernity. As Castro Flórez noted (2010 p. 144) "Art accomplishes sometimes the exemplification of silliness, completing a step, even acrobatic from the pseudo-transgressive to absolute frivolity". In "a time when culture is seen as essentially useless, something which can be "cutback "or thrown to the skinny arms of philanthropy" (Castro Flórez, 2010, p. 146), others complicate their existence in search of a participatory landscape. Without visionary spirit, but decidedly observational, they propose a reflection on the state of the map. Reborn out of the ashes of fanzine slogans from the no future era, out of the rebellious teenage attitude of graffiti vandalism, later instructed in the domesticated driftings of street art, they have come to the conclusion, like Tristan Tzara, that there is a great amount of destructive work to be done. Out of the deconstruction of symbolism, they propose a critical map, from the perspective of Rancière "art cannot do anything else other than knowing and wishing, while beauty cannot be conceived in any other way, than that which does not end up in knowledge or wishing." Without photojournalistic rhetoric, without the epic moment of the photographer taking the shot, this project constitutes an instinctive practice of archiving and an exercise in assimilation. This means appropriating the image, rescuing it to reinsert in a time "liberated" from the present day. Covering, not censoring. Making visible through concealment. Not prohibiting speech, but instead prohibiting not listening, not seeing, prohibiting the apathy with which conflicts are viewed. The exhausted viewer's gaze needs precise homeopathies. Concealment is a system of visual acuity, an incentive to criticise the gaze itself. We are facing an organised prejudice evacuation process, visual tools for media hygiene and disinfection. So the banners are covered, so they can be seen better. Art produces "other extensions of seeing." 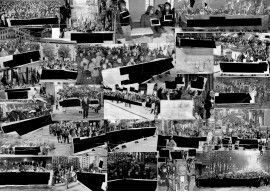 Images of social unrest function as the tapestry of a troubled world, but the forms produced by the cover-up process, the black stains, also speak. These adapt to the banner like one more phrase, become new logos, new images which enter into and exit from discourse. These stains have achieved a perturbing clarity. They came to adapt themselves to the shapes of placards and headlines in press photos, but as soon as you relax on the visual journey, they seek autonomy and a place within the social landscape. Nothing can be done about this. The "censoring" role is the very quality which liberates it. Time has amalgamated in this gathering of altered photographs. Images of forgotten conflicts overlap with memories of people, demonstrations, stories in permanent crisis. Now there is only one time, our own, which seems to claim us. Now there is only one way to say "now": "No landscape. On the walls of the street, behind the walls of the factory, in the industrial estates, what landscape should we expect if not the landscape of insubordination? The search for an industrial landscape and traces of their activity is part of Igor Rezola's strategy to cause political-aesthetic friction. The echo of that friction ends up as the mass production of its meaning (there are images which can almost be heard as a chirp, like a siren, like an alarm). This strategy of approaching issues such as "time" and "work" does not fall into the perverse aestheticism of the "post-industrial", but raises the category of "landscape" to conflict, as a confrontation against the apathy of cultural production. Igor's video actions and photographic series are always developed in public space, and deal profoundly with the rhetorical traps of work, and those ideological strategies which maintain them as a time bomb in the centre of the economic system. The tremendous paradox between hatred of work and the all-consuming battle to stay in work, even under conditions of genuine precariety, accounts for a social landscape turned into a fighting space. “White deeds" and "black deeds" are interventions in which painting takes over the street due to the illegal nature of practising it in public space. Like a boomerang, recording these images brings us back to a tense landscape which blends the tangible with political circumstance, without any possibility of separating the the two elements. The economy of means, the always orthogonal frame, the raw and desolate picture, attracts the gaze, only to undergo the expressive sparking of an action. 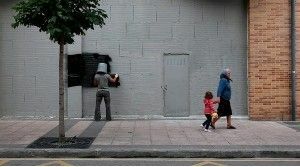 A quick and precise action, because there is always street surveillance. A wall demands the same attention as a landscape. A grafitti is half its written message, and the other half that which is erased by its letters. 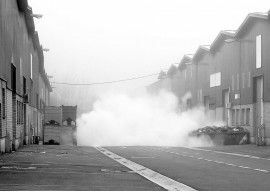 A cloud of smoke is suddenly an explosion of meaning among the silence programmed in the working hours (in those empty and dull spaces where the murmur of work routines can be heard). A small gesture takes on meaning when time and space are used properly; the frame and the unframed, when black and white are used as primary, secondary and tertiary colors to compose a mural without scenery. Landscape is a construct, a concept which lets us interpret the cultural and aesthetic qualities of a given territory or place. Therefore, landscape is not something which has always existed, it is a phenomenon which does not exist without an observer, but mostly it is an invention of art itself. An intervention occupies a space, maybe a landscape? in order to modify or change its meaning. If artistic intervention has a critical sense, a material or conceptual reproduction of the subject of intervention must exist. The landscape is there to ensure a subjective view; intervention, to turn landscape around. 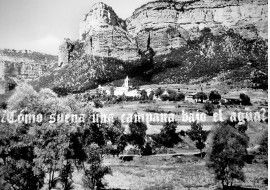 Sant Romá de Sau's landscape was intervened upon, and painfully turned around by a regime more concerned with controlling the forces of production than for the people's lives. Now, Mawa not only "maps" the landscape a second time, but also redefines its limits, questions preset visions and above all, brings new agents into involvement. His research is not definitive, but is based on something as honest and as difficult as the wish to make intuition into a method. There is no outcome except a collection of images, voices and sounds woven in different ways, and presented as a complex web of feelings, knowledge and suggestions. It is not a documentary, though there is a document. There is a practical ability which displays for us the identification between what is said and how it is said, while safeguarding its complexity. The author proposes a form of knowledge which is foreign to styles and rules. And this is where we find ourselves challenged. There is no spectator, only an accomplice; the possibility of seeing without "learning to see" never arises. "No landscape" is a landscape that we must "learn to see". Sant Romá de Sau. Video. 4:00 min. Flying over the place aboard memory. Travelling back in time with the subjective map of narration. Heading towards the vanishing point, to wade across with the compass of experience. The flood could not stifle all voices. The day opens up, we feel the water's surface like a sheet made of whispers. In front, the mountains, gave up making echoes long ago. The route unfolds across the map as we approach the designated place and see the carved stone at the base of the tower. Then, suddenly, time spins, changes course, memories are synchronized and the horizon opens out. What does a bell underwater sound like? The concept of landscape allows us to interpret the cultural and aesthetic qualities of a given territory or place. In its definitions, "the amount of land which may be seen from a given place", or "the portion of land considered from its artistic aspect", the combined action of its two constituent aspects may be encountered: on the one hand, the subjective view, and on the other, the specific and meaningful consideration of this subjectivity. Therefore, landscape is not something that has always existed, is a phenomenon which does not exist without an observer, but mostly it is an invention of art itself. Resorting to landscape as a basis for this exhibition proposal may seem forced, but it is the quickest way to explain something which has arisen from the relationship between our works. Because, for some reason, we have seen in them a kind of unexpected aestheticism. This is something which has emerged unintentionally, and which has shaken out of our project, without us knowing quite what to do with it, since there is a kind of methodical precaution against such results or such formalisations which end up being so nice due to their “artistic” nature. A whole career spent fleeing from the identification between art and beauty, and now we find ourselves under pressure of circumstances just when we would rather speak of politics ... "Social Landscaping", "intervention in nature" and "intervention in the urban landscape" ...; suddenly the consistency of all these categories crumbled in front of us and shaped a new landscape. And so on. How to take control of this situation? How to short-circuit it to find a strong theme for this display? The intervention occupies a space in order to modify or change its meaning. If artistic intervention has any critical sense, a material or conceptual re-production must exist of the subject of intervention. The result may be more or less stable, but must be completed through perspective, through active reception, or through participation. The landscape is there to ensure a subjective gaze; intervention, to turn landscape upside down. Text: Juan Pablo Orduñez (MawatreS), Igor Rezola y Arturo / fito Rodríguez. Survivor, he has devoted most of his time to being smeared in mud, paint and spray paint. Originally from the world of graffiti and street art, his work has drifted over the years towards conceptual intervention. Concerned about the elements which construct and condition the city, and the city's customs and meanings, he works on the idea of ​​intervention even without knowing exactly what the word means as an artistic discipline, but discovering it at every step. He was born in Madrid and lived there until he was 12 years old. He is 27, and has lived in Bilbao for many years. His recent works focus on the idea of ​​"tradition", with an understanding of history as a complex context; as if it were possible to circulate between the lines in history books and spin the text around. His artistic practice is closely related to his personal journey as a worker in the metal sector and as a graffiti writer and muralist, issues which he viewed from new perspectives when accessing academic and artistic training. In his current proposals three strands of study may be distinguished, merging in various ways: in the first place, artistic practices which occur on the margins of the law; graffiti, street art, but also proposals with a political/social/trade-unionist edge, with or without artistic pretension. In the second place, the ideas of private/intimate space and public space. Spaces where ultimately the above practices are inserted. And thirdly, the idea of (waged) labour, and its ability to condition different spheres of life, including artistic production itself. - "Artistas residentes en Pekín". Sala Araba. Vitoria 2013. Currently professor at the Departamento de Arte y Tecnología from the Facultad de Bellas Artes at Universidad del País Vasco EHU/UPV. Founder member of the collective "Fundación Rodríguez", executing various artistic and cultural projects between 1994 and 2012. Former lecturer in the experimental area at the Centro de Imagen y Nuevas Tecnologías de Vitoria-Gasteiz, between 1990 and 1994. He has curated seasonal projects such as "Stand by: TV" for Caixaforum in Barcelona, "Panel de control: Interruptores críticos para una sociedad vigilada" in Centro de Arte de Sevilla, “Beste Bat. Una mirada al rock radical vasco” (junto a Miren Jaio) in Sala Rekalde de Bilbao, "Spots electorales: el espectáculo de la democracia" 2008, Palau de la Virreina, Barcelona (with Jorge Luis Marzo). "Jaime Davidovich: Morder la mano que te da de comer", 2010, Artium, Vitoria - Gasteiz, etc. He writes occasionally for the specialist press on art and contemporary culture.